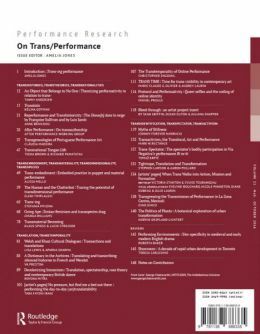 In the special issue On Trans/Performance authors address a range of intersections between trans- (implying exceeding, moving towards, changing; going across, over or beyond) and the performative (saying as doing, or that which performs something while articulating it). The trans- implies movement and fluidity while the performative implies action and opens up questions of agency; together, they point to innovative ways of thinking about topical questions such as how we live and take action, how we identify ourselves and others, how we write history, and how we approach local versus global tensions and intersections. In this issue articles and thought pieces, as well as artists’ projects attending to the interrelation between trans- concepts and performativity, allow for the emergence of new insights regarding how performance theory works across fields such as language (translation), history (transformation or change), gender/sexuality (transgender and transsexuality or transidentification), and culture (transnational).